or click on page number at left. To the Grand Lodge I.O.O.F. of Texas: It was an honor that the Grand Lodge Body chose to elevate me to the rank of your Grand Master for the term of 2006-2007 of this great state of Texas. Great consideration has been taken before making any decisions. I would ask myself what was best for the Order. The Grand Lodge Executive Board was consulted before any major problem was undertaken. I always had the unanimous consent of the Board. 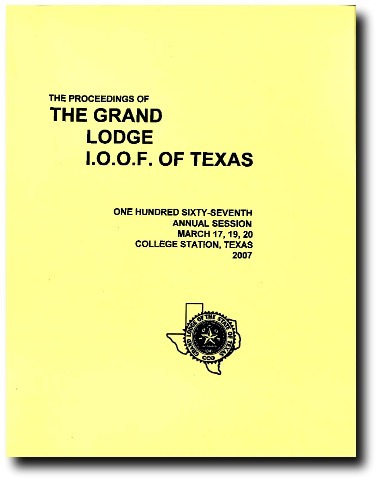 One of my saddest duties this year was to demise Lone Star Lodge I.O.O.F. Lodge No. 1 in Houston because of ongoing problems in the lodge. We will be preserving the name of the charter by proclaiming it as THE HISTORIC LONE STAR LODGE NO. 1. 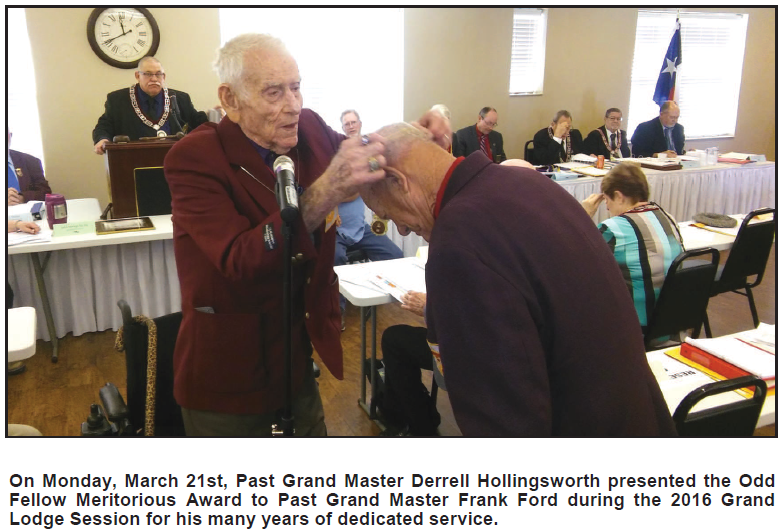 It's charter will hang with honor at the Grand Lodge Office in Corsicana. To the girls in the Grand Lodge Office, Nancy, Darline, and Christy, thank you for all your help. Without you, my job would be much more difficult. To the Grand Secretary, Dixon Toney, thanks for all the help you have given me this year. Every time I have called you for advise, you have always given me your best advise. Thank you for taking the job as my Degree Captain this year. You have traveled many miles this year to help with degrees as well as traveling with me whenever I needed you. You have made my job easier. We had the pleasure of instituting a new Junior Odd Fellow Lodge in Paris. My thanks to all who worked so hard to make this happen. Thanks goes to the Paris and Commerce lodges for co-sponsoring this Lodge. My Grand Lodge Youth Committee has worked really hard this year. Thanks to James Daniel, Chairman and Karen Cook for all you have done to help our youth. We had the privilege to have an outdoor degree rally in Brother A. C. Dowell's pasture this year. Hopefully, this will be an annual event. Thanks to all the lodges who held a degree rally. To the Grand Lodge Executive Committee, thank you for all of your support and hard work this year. I have had to call upon you several times and you were always there for me. I could not ask for a better Executive Board. Brothers Connie Baker, Deputy Grand Master; Jack Griffith, Grand Warden; Dixon Toney, Grand Secretary; Bob Kirby, Grand Treasurer; and James Curtis, Junior Past Grand Master, you all have traveled many miles with me this year. All I had to do was pick up the phone and call. To my lodges, Winnsboro I.O.O.F. No. 19; William Tell I.O.O.F. No. 27; Mt. Pleasant I.O.O.F. No. 66; and my Rebekah Lodge, Winnsboro No. 71, thank you all for your support this year. To the W. & 0. Homes Board of Trustees and the Grand Lodge Board of Trustees, you all work really hard and I do not think you are appreciated enough for all the time and effort you put into it. No one knows what all you do until they follow in your footsteps. You are all very dedicated to the Board and I cannot begin to thank you enough for all your help. I wish every Odd Fellow would take the time to visit one of the Board meetings. My hat is off to Geri Callender, Director of the Retirement Home and to Kelly Wolfe, Administrator of the Nursing Home. You both work long and hard hours to keep our homes running for us. A job well done to both of you. You are deeply appreciated. To the lodges who have received me and gave me such a great welcome on my visits, I will always remember these visits as the highlight of my term. To my Grand Parliamentarian, Bill Guy, man what can I say to you? Thank you for all your help. You are always there if I need you. A great big thank you. To my Membership Chairman, Danny Wood, you have worked hard this year on membership. Thank you for the seminars you gave at the different lodges and all the other help you gave to me this year. To the President of the Rebekah Assembly, Nella Johnston, it was good to serve with you this year. Sister Nella and I had several joint meetings this year. It is great when Odd Fellows and Rebekahs can pull together. To my wife, Rosa, who just happens to be the Warden of the Rebekah Assembly of Texas, thank you for your support and for being my traveling companion and my personal secretary by keeping my calendar of dates of when and where I was to be and also for being my sounding board when I needed one. I also had the privilege to visit some Rebekah Lodges this year with the Assembly Warden. What a great honor that was. Some of the lodges said it was the first time a Grand Master had ever visited their lodge. Let's keep pullin' together for Odd Fellowship.